Last week the Times reported that Marylebone Cricket Club, the owners of Lord’s, decided that any redevelopments at Lord’s will be done on a “stand-by-stand basis”. Although widely regarded as one of the best cricket stadium’s in the world, the committee would look to fund redevelopments on the freehold land MCC own which, Chairmen Oliver Stockden says, will “provide significantly improved amenities”. However this is no straight forward process as planning approval must first be granted by Westminster Council as well as approved by at least two-thirds of the 18,000 strong MCC members. Marylebone Cricket Club are the guardians of the law and spirit of cricket and so one would expect that the redevelopments must be worthy of Cricket’s home ground. Lord’s is a wonderful mix of old and new, with iconic sights such as the Old Father Time weather vane, subject of the poem Lord’s Test, which sits atop the Mount Stand or the 121-year old Pavilion, which has seen crickets greatest players visit. In 2004 Lord’s spent a considerable amount re-fitting the Pavilion including a redecoration of the Long Room. The new development will probably start further improving the Pavilion. There is also the award winning J.P. Morgan Media Centre, which provides journalists and commentators uninterrupted views of the field and was built using boat-building technologies. However other cricket stadiums in England have also invested significant sums into redeveloping their own facilities in order to win the right to stage International cricket fixtures. 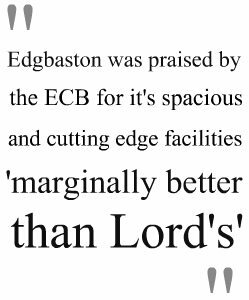 Recently Edgbaston was praised by the ECB for it’s spacious and cutting edge facilities ‘marginally better than Lord’s’ following a £32 million redevelopment. Within the new state-of-the-art Pavilion Stand guests will find some of the best hospitality facilities in the UK as well as one of the best atmosphere’s in English cricket. Furthermore The Rose Bowl recently invested over half a million pounds in erecting permanent world class floodlights, the only cricket stadium in the UK to do so, which allows them to stage International fixtures day or night, thus offering maximum convenience to spectators. With the competition between cricket stadiums becoming ever more tough with emerging stadium’s such as Southampton’s The Rose Bowl or Cardiff’s SWALEC Stadium, MCC will be looking to ensure Lord’s Cricket Ground continue to receive the Platinum package of major matches by the ECB. Also Lord’s has the honour of traditionally hosting the first England Test of the summer. We’ve still limited availability for Lord’s hospitality packages and Edgbaston fixtures as well at the fantastic Kia Oval, for England international fixtures in 2012, so contact us today to avoid disappointment!